An antidote to fearmongering headlines and fake news, outreach roles such as Connie Potter’s, as Conference, Events and Special Guest Organiser at CERN, are increasingly vital to the scientific community. Connie spoke with STC from CERN headquarters in Geneva about her efforts to demystify the inner workings of the largest particle physics laboratory in the world, delivered a word of warning from the creators of the internet, and explained how Lucy Kirkwood collaborated with CERN to create Mosquitoes, running at Sydney Opera House Drama Theatre until the 18th of May. Could you describe your role at CERN? I am a conference and event organiser. However I have a keen interest in science outreach and communication, and in the last few years I have set up several programmes that have brought CERN and physics to a whole new audience. The first is the CERN Special Guest programme whereby I invite well-known artists who I think may have an interest in a private visit to CERN. The second is a programme to reach new audiences through taking CERN and physics to new venues, specifically music and culture festivals. Both programmes have been very successful: we have had a huge range of artists from Kings of Leon to MUSE to Metallica and most recently Roger Waters, and all have communicated their enthusiasm and interest to their millions of fans through social media. As to the Festival programme, we started in 2016 at WOMAD festival in the UK, where we now present ‘World of Physics’, with three spaces and over 5500 people passing through in 2018. We have more festivals in the pipeline this year. Why do you think people have been fearful of the work at CERN in the past? I think it’s a natural human reaction to be wary of what you don't understand, what you can't see. Add to that the lurid stories on social media and it is not surprising that some people might mistakenly believe the work at CERN is dangerous or bad. 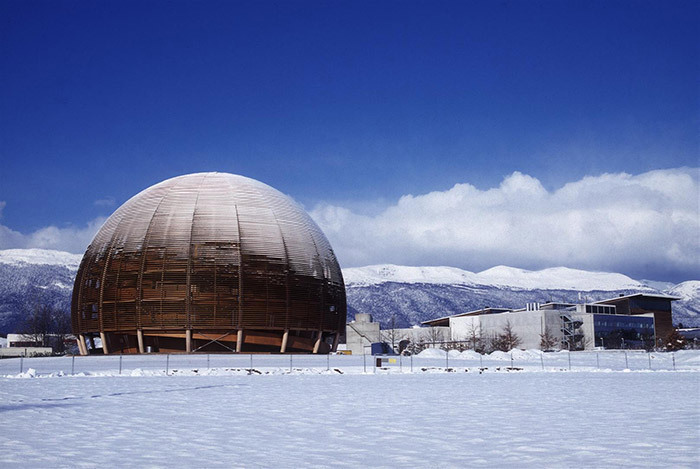 It makes communicating with the general public and events like the CERN Open Days, when the whole laboratory is thrown open to everyone to visit, vitally important. Equally, art inspired by science is a terrific medium for encouraging open discussion on science, and Lucy Kirkwood's play Mosquitoes is a great example of that. CERN clearly goes to a lot of effort to communicate its work to the public. Was it always so, or has this become a greater priority over the years? Communication has always been extremely important at CERN, it is part of the CERN convention. Interest in CERN - both negative and positive - has grown over the last decade, and additionally we have seen a huge increase in people actually wanting to visit the laboratory (many members of the public are very surprised to learn that one actually can visit CERN, every day, Monday to Saturday). We now put a lot of effort, with a small team of people, into sharing the work that is done here, and that includes working with our scientists to help them describe their work using simple language and analogies. What is the one thing that you wish more people understood about CERN? It’s not specifically CERN-related but more physics related. I would love people to realise that physics is not 'only' for 'really smart people'. I have no scientific background whatsoever. I didn't like any science subjects at school; my forte was languages. And yet having spent many years in the company of physicists, organising their conferences, sitting together at dinner listening to their conversations and they in turn answering my questions, and finally watching them explain with such passion and excitement the work they devote their lives to, I have become one of the strongest advocates for physics and by extension CERN. Give yourself a chance, don't put yourself in a box, come to one of our events or go to your local university open days and just ask them what you want to know. No question is too stupid. Speaking more generally, what responsibility do you feel the scientific community has to communicate its intentions and progress with the general public? It’s hugely important. It would be wonderful if all scientists were to do a certain amount of outreach with the general public every year, yet I know it’s not easy for some. They are very focused on their work and are not at ease in certain situations. But if you don't communicate the truth, the real facts, someone else may step in and communicate damaging mis-truths. The past few years have seen a boom in art-science collaborations which have produced some terrific work. The fashion designer Iris van Herpen has spent real time at CERN with physicists, talking, learning, asking lots of questions, the result of which was a magnificent haute couture collection entitled ‘Magnetic Motion’. These types of collaborations are incredibly useful both for the artist and the scientists involved. It pushes them both to make themselves understood in a common language. Is media reporting of scientific developments trustworthy? How do you think it could be improved? Is any reporting 100% trustworthy? On some level it will always be one person's impression or opinion. While scientific facts are clear and proven it’s only a short step to adding a dramatic, headlining-making twist to those facts. Equally some reporting is presented as factual when in fact it is still theoretical or even just guesswork. I sometimes wonder if it wouldn't be worthwhile for journalists to spend real time with the people they are reporting on. In the case of science, to have them spending time inside real scientific institutions alongside real scientists. Get to know what makes them tick, what brings them down, their passion for their work, the challenges and frustrations, the sense of community and working towards a common goal. Lucy Kirkwood actually did a lot of research herself for the play and then took it a step further and worked closely with me and actual ATLAS physicists on scientific elements in the play during the course of many skype conference calls and emails. What role has the internet played in the changing nature of this coverage? We recently celebrated the thirtieth birthday of the World Wide Web, which was invented at CERN, with a great event attended by many of the pioneers of the Web, including Sir Tim Berners-Lee. The main message that came through from them was regarding data privacy, and how crucial it is now for each of us to become aware of what we are giving away when we click on the 'I agree' box on a website. That said, the internet has brought us so many more opportunities than we have ever had before. If we take the example of institutions like CERN or NASA, when we relied on newspaper or TV coverage for information one knew only on a superficial level about the work they were undertaking through occasional programmes or articles on momentous occasions. Now you can sign up to CERN or NASA social media channels and be updated regularly on everything that is going on. Even better, CERN offers Facebook live events where a whole topic is covered live online and you can ask questions in real time of the presenters. It really is quite extraordinary to be able to do this. It's often said that “the information age is the age of anxiety". What are your thoughts on this statement? Sadly we cannot deny that there are many negative aspects to having twenty-four hour, seven day a week access to information and communication. People getting into debt, online harassment, feelings of inadequacy among young people, targeting of vulnerable individuals, the list goes on - and yet there are so many positives. You can learn almost anything online and that includes studying for educational qualifications. Internet communication apps have brought families and friends together all over the world in a way that was previously impossible. It is up to the individual to decide how and to what extent we want to use the information. I would like to think there is a movement out there gaining momentum now, people coming together to say ‘enough, we have the control, lets use it wisely’.